Toyota Tacoma » What Will Be Different About the 2020 Toyota Tacoma? Recently, Toyota finally gave drivers their first look at the upcoming 2020 Toyota Tacoma! 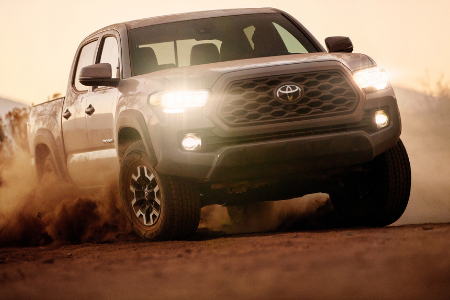 For years, the Toyota Tacoma has dominated the midsize pickup truck class and looks to continue that success in 2020 with numerous new changes and features. We’ve got the scoop on what we know will be different for the Tacoma in 2020! 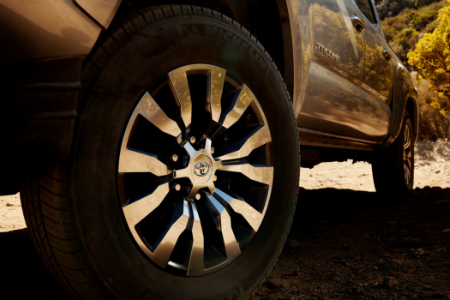 The Toyota Tacoma has been the top midsize pickup truck on the market for years. Now, though, there’s been an increase in competition as other brands are trying to capitalize on increased driver interest in the smaller pickup trucks. Don’t worry, though, because the 2020 Toyota Tacoma is ready to take on all challengers with loads of new modifications and features! Perhaps the biggest new addition is a new multimedia system that includes Apple CarPlay, Android Auto and a new 8-inch touchscreen available on SR5 grades and higher. On the exterior, practically every 2020 Toyota Tacoma trim has changed to its look, with a new grille and wheel design on almost every model. The 2020 Toyota Tacoma SR5, for instance, which features a new grille design, new 16-inch dark satin wheel color, darker taillight housings and new fabric design on the seats. Drivers are always excited to see what the new Toyota Tacoma TRD Pro will be bringing to the table, and the 2020 edition won’t disappoint! The 2020 Toyota Tacoma TRD Pro has numerous new improvements and updates including new sequential LED headlamps, black-insert taillamps, Rigid Industries LED fog lights, and a newly available Army Green exclusive color for 2020. Inside the 2020 Toyota Tacoma TRD Pro, drivers will find a new 10-way power seat, the upgraded multimedia system and a new Panoramic View Monitor and new Multi-Terrain Monitor for increased visibility! Want to learn more about the 2020 Toyota Tacoma? Keep up with our blog as we update it with more information as we get closer to the 2020 Tacoma’s release date! This entry was posted on Monday, February 11th, 2019 at 5:15 pm	and is filed under Toyota Tacoma. You can follow any responses to this entry through the RSS 2.0 feed. You can skip to the end and leave a response. Pinging is currently not allowed.